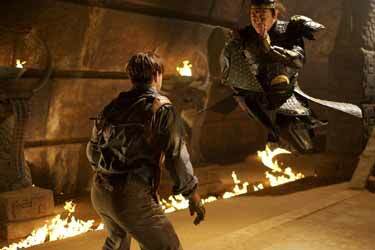 If the Mummy franchise is Universal’s answer to Paramount’s Indiana Jones series (and let’s face it, with all its tomb robbing, relic hunting and period supernatural derring-do, that’s precisely what it is), then it’s been a lot quicker off the mark this time around! The first film in the series hit the big screen in 1999, a decade after Indiana Jones and the Last Crusade. This year, the Mummy franchise is being relaunched hot on the heels of the first Indy film to be released in what seems like eons, Indiana Jones and the Kingdom of the Crystal Skull. There are still similarities between the two franchises, especially when it comes to the notion of the hero(es) handing over the reins to a wayward grown-up son (in this case Alex O’Connell, played by Luke Ford). However, this time around both movies were in production at about the same time, so one can safely assume that such commonalities are unfortunate coincidences rather than unashamed rip-offs. 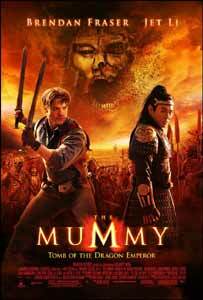 Though of course it needs it for the purposes of product recognition, perhaps the producers should have dropped the word “Mummy” from the title. Though Emperor Han (Jet Li, Lethal Weapon 4) is cursed to an undead existence and preserved for thousands of years, just like Imhotep in the last two films, his “terracotta army”-style perpetuation doesn’t really make him what most people would call a mummy. Maybe the mummy of the title is actually Alex’s mum, Evelyn (Maria Bello taking over the role from Rachel Weisz, who evidently didn’t need the money). No, that can’t be right - this is an American movie, which makes her a Mommy! South America would have been a more logical location for finding a mummy outside of Egypt. It seems that the production team has already thought of that, though, because dialogue near the end of the picture suggests a Peruvian setting for the next one. The Asian locale does make for a nice change, however. 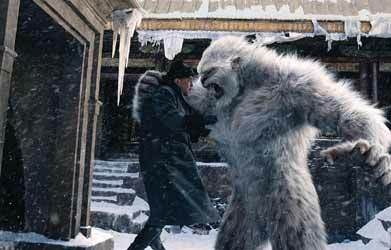 Though we still get some desert sands, our heroes also have to brave the snow and ice of the Himalayas - and meet some friendly Yeti. Do I detect a hint of cinematic payback for the Chinese government’s subjugation of Tibet as the Tibetan Yeti attack the Chinese bad guys? 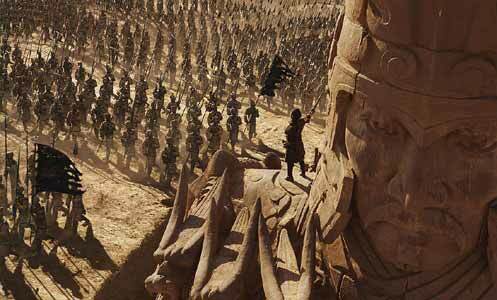 Thankfully, the CGI has improved since the dreadful rendition of the Scorpion King at the end of The Mummy Returns. I must admit that I have always found Brendan Fraser’s goofy performance as Rick O’Connell to be oafish and charmless, and unfortunately he hasn’t improved - quite the opposite, in fact. Luke Ford as his son is even worse, well and truly taking after him, while Jet Li is surprisingly bland as the villain, making this an almost charisma-free zone as far as the male characters go - with the honourable exception of David Calder as Roger Wilson, whose character is at the centre in a plot twist that I didn’t expect. No, I haven’t forgotten about John Hannah as Evie’s brother Jonathan, who remains as amusing or annoying as he ever was, depending on whether or not you liked him in the first place. However, the female characters in this movie are really rather good. Maria Bello (A History of Violence) assumes the role of Evie with consummate ease. Her vocalisation of the character sounds remarkably like that of Rachel Weisz, and her introductory scene involves a witty bit of writing by Alfred Gough and Miles Millar (Smallville, Spider-Man 2). Meanwhile, Asian actors Michelle Yeoh (Tomorrow Never Dies, Crouching Tiger Hidden Dragon) as the sorceress Zijuan and Isabella Leong (The Eye ...Infinity) as her daughter Lin are equally adept at acting and action - which, as you might expect, includes a fair bit of martial artistry. Despite its attempts to move in new directions, Tomb of the Dragon Emperor does drag on, and is the weakest of the Mummy series so far. Nevertheless, I am intrigued to find out what might happen in Peru, so I’ll almost certainly go and see the next film - which is surely what the business of sequels is all about.